Sunshine and cool ocean breezes. Sandy beaches and splashing waves. An attendant dropping by my lounge chair every half hour ready to bring whatever I desire: a diet cola, pina coloda, or chips and salsa. 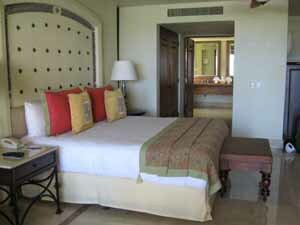 Yes, I really am working, checking out the Marquis Los Cabos Resort in Mexico for future visitors. framing the angel statues for which the resort is known. 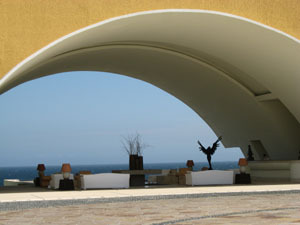 Open to the infinite sea, the reception area provides an incredibly beautiful introduction to this slice of paradise. Immaculately landscaped grounds, more than 40 pools, a spectacular 36 foot waterfall, and original Mexican artwork in every room and public area are additional feasts for the eyes. Then there are the sounds, the waves rolling up to the beach and crashing onto shore in a display of power. Yet, the regularity of a rising and falling sea manages to calm the soul while other water features add soothing background sounds. Salt spray perfumes the air; and that slight fishy smell is explained as the ocean cleaning itself. Then there are flowers, some sweet and dainty, others (like society garlic) faintly pungent. Walk barefoot in the sand, stretch out for a nap in the rope chair hanging beside your casita, or dip toes into your private plunge pool for a sample of tactile experiences. 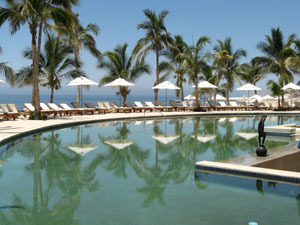 Splurge on a massage or other spa treatment, or become one with the sea during an early morning open-air Yoga class. And, of course, there is water—pool or ocean—to tantalize touch. Your sense of taste is in for the most exquisite treat when you dine at Canto Del Mar, the resort’s intimate gourmet restaurant, where the menu changes daily—according to whatever fresh ingredients are available—and the sommelier pairs delectable Mexican wines you’ve probably never tasted before with the day’s offerings. 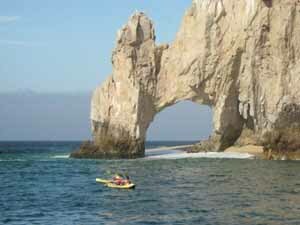 Snorkeling is available from a schooner partly owned by the hotel, and you’ll pass by the scenic El Arco de Cabo, where the Sea of Cortes meets the Pacific Ocean. A beach takes shape under this natural rock formation only once every four years, an event that is happening during our visit. It only takes a few hours to transition from work mode to relaxation, especially with the incredible level of service from staff. 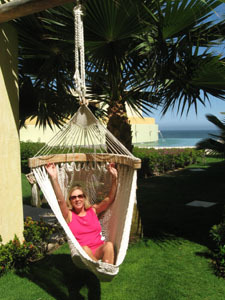 From the fruit smoothie offered upon our arrival to the guacamole, salsa, and chips awaiting in our casita, to the daily breakfasts delivered via two-way cubby (coffee is still hot, even if not poured from the insulated carafe for several hours), serenity and euphoria soon take over.